495 years ago in the little college town of Wittenberg, in Saxony, Martin Luther’s theology had not yet been sufficiently burnished in the furnace of conflict and affliction to produce such a succinct list. 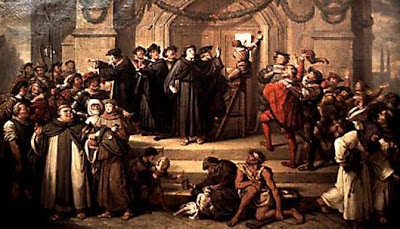 Indeed, in the span of a single month—between the end of September and the end of October in 1517—Luther detailed two prodigious lists, the lesser known "97 Theses Against Scholasticism" and the better known "95 Theses Against Indulgences." Both Latin texts were posted on the College Chapel door for the purpose of discussion within the academic community—but both were quickly translated into vernacular German and transmitted far and wide by means of the new technology of moveable type printing presses. Afterward, this Reformational worldview was cogently summarized in the “solas.” Informed by the Scriptures alone, concerned for the glory of God alone, because of the grace of Christ alone, producing faith, which alone was effectual for salvation. This not only beautifully described Gospel doctrine; it beautifully described Gospel life. Thus was reclaimed the Scriptural teaching of the sovereignty of God over every aspect of the believer's life. As the Westminster Shorter Catechism asks, "What is the chief end of man? Man's chief end is to glorify God and to enjoy him forever." This great and all consuming purpose called for all of life to be lived under the Lordship of Christ. Every activity of the Christian is to be sanctified unto the glory of God. Everything we have, everything we do everything we are is pledged to His greater Kingdom purposes.